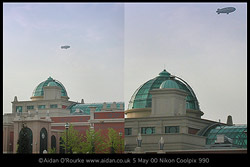 Seen from the Trafford Centre, the Good Year airship floats gracefully above the Manchester Ship Canal. When the airship appeared over the city, Manchester was taken by surprise. She was flying so low that the noise of her engines drew thousands of people... The airship's number could be plainly seen. 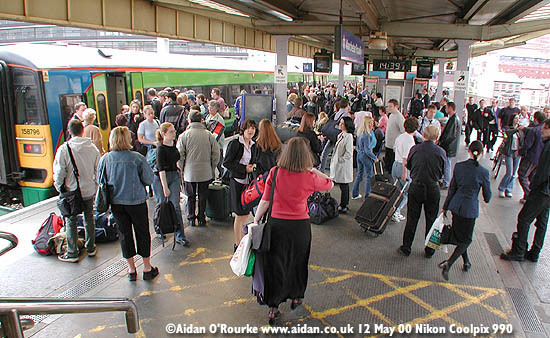 In the suburbs, housewives ran to their doors..."
In 2000, rail travel in north west England still leaves much to be desired. Delays and cancellations are a daily frustration for thousands of passengers, addressed patronisingly as 'customers' in station announcements. The train on platform 14 here at Piccadilly Station is about to depart for Liverpool, but these 'customers' are waiting for another train, which has been delayed. Eyewitness says: Follow Metrolink's example and address passengers as 'passengers'. Railtrack, the company which owns stations, rail lines and associated property, are carrying out a major refurbishment programme on station buildings all over the UK. In 1999, Piccadilly Station's 1842 train shed was completely refurbished. 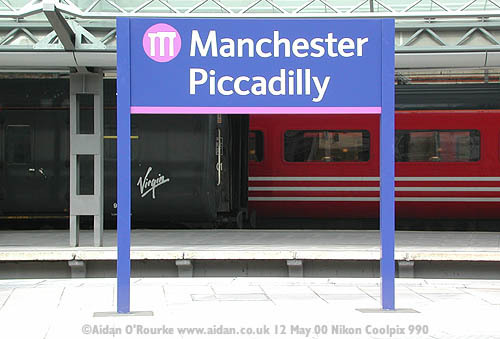 And in May 2000, new signs were unveiled, sporting a new colour scheme of blue, purple and grey. 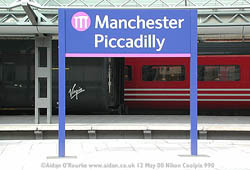 The circular logo depicts a train crossing a railway viaduct, presumably the one in Stockport, used every dat by trains travelling between Manchester Piccadilly and London Euston. 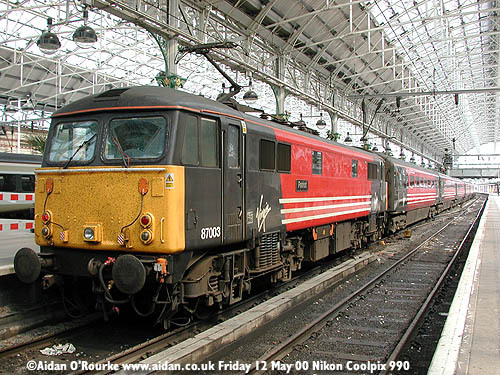 Purple is said to be the colour of the millennium, but when it comes to trains, I prefer red. A Virgin Trains electric locomotive stands on a central platform of the recently refurbished Piccadilly Station. It began its working life under British Rail, which was split up and privatised by the Margaret Thatcher's Conservative government. Britain's most famous entrepreneur Richard Branson obtained the franchise to operate trains on the west coast line between London and the north west. Within a couple of years, tilting high speed trains will be introduced, cutting the journey time between Manchester and London from 2 hours and 30 minutes to around one and three quarter hours. 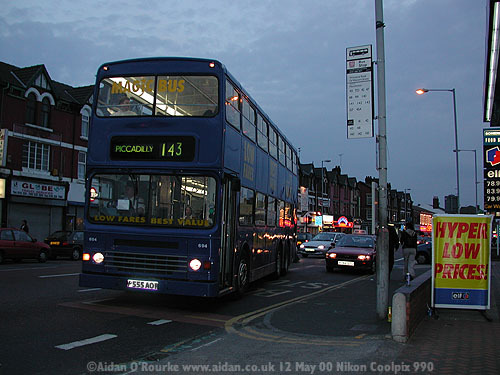 These three axle Dennis buses with their bone-shaking suspension are operated by Stagecoach subsidiary Magic Bus. This 143 has just taken on some passengers and is about to continue its journey to Piccadilly. 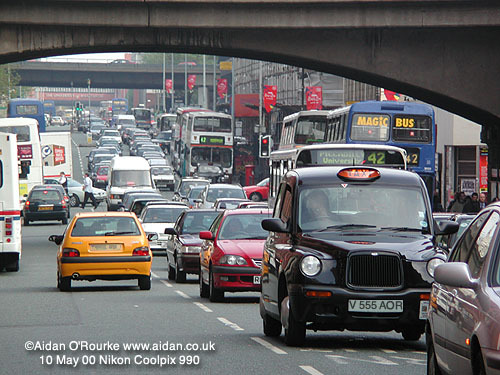 The 'student corridor' along Wilmslow Road from Didsbury to Manchester city centre is heavily used and very lucrative for bus operators. 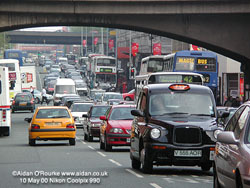 Fares on Magic Bus are lower than on Stagecoach services. In May 2000, a Stagecoach 'Megarider' weekly ticket costs £5.70 when purchased on a Magic Bus and £6.70 on a Stagecoach bus. On Magic Bus, the fare into Manchester from this stop is 45p. This long straight road is lined with rows of typical late 19th century terraced houses. 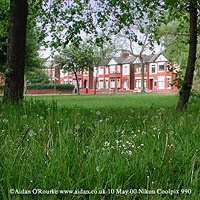 From their front bedrooms residents have a view over the playing fields of Manchester University. 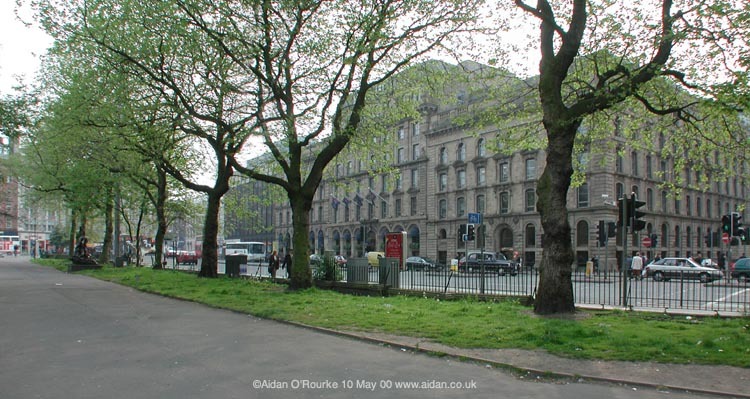 The distinctive flat-topped street lights are over 40 years old and unique to this road, which is named after a famous 18th century landowner whose name was also given to a street in the city centre, and a road in Trafford park.